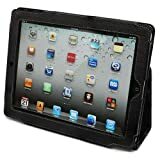 Snugg iPad 2 Leather Case Cover and Flip Stand with Elastic Hand Strap and Premium Nubuck Fibre Interior (Black) - Automatically Wakes and Puts the iPad 2 to Sleep. Superior Quality Design as Featured in Wired Magazine. The extremely popular Snugg iPad 2 Case is here! A black PU leather premium case which folds in all the right places. Stands up perfectly for FaceTime or watching movies and there is a cut out for the rear camera so that you can use the camera without removing the iPad 2 from the case. Other features of the case include the ability to fold into the perfect typing position. Elastic hand strap for a comfortable, improved hold while walking, exercising, lounging, or using FaceTime. 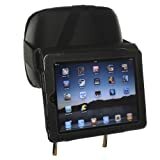 High quality soft nubuck fibre interior and velcro flap to secure iPad 2 tightly in place when in landscape position.